Aww, geez....I didn't want to read this! Plans, I tell you....I had plans! You've save me a lot of pointless tinkering though. So thanks! Yes, I understand, but the backlash I was referring to is in the focuser assembly because the knob gets too loose/backs out from the proper position. Ah OK - I've not seen that with a C8, but did have exactly this trouble with my 127mm Mak, thanks (presumably) to a tinkering previous owner. My example of this scope requires the focus mechanism to be slightly pre-loaded as the knob is fitted, to eliminate backlash. Otherwise the mirror slops backward and forward with the focus control! Fixing it requires removal of the rear cell from the tube, and the joys of re-collimation. I wonder (that means I feel a stupid question coming), why not place a teflon sheath on the outside of the primary baffle tube to make the fit between it and the inside of the primary mirror hole tighter and mitigate the mirror flop? When Celestron introduced the Edge HD series, they realized that the centering tolerances where tighter so they tightened the tolerances on everything. The problem is that when you try to handle a problem like this with tighter tolerances. you get some systems that work well and some that don't. As I've said many times in this thread, the key to solving this problem is a kinematic design that zero clearances the slop in the baffle tube slider. This would look a lot like a Crayford focuser at the rear of the mirror and might use three nylon screws at the front of the slider tube. I am very confident that with the right design, mechanical slop could be reduced to near zero. the problem is, any adjustable system is prone to fail. It has to be foolproof. Sliding tubes are foolproof. The system you describe won't allow average enthusiastic Joe to disassemble his scope for whatever "improvement" they deem necessary. Celestron simply doesn't want herds of customers demanding free adjustment - it is just a bad business model. As there is no simple cheap solution, they continue with whatever worked for so long. It really would only take a little more time in the CNC department for the offset for tool wear to be entered, kept up with and parts fit checked to correct the issue. You can not set a CNC machine to just keep running parts and not adjust or allow for tool wear. It's not that the parts are so hard to machine that it can't be done on a consistent basis. It really is a simple fix, it's called time and attention. If Celestron ever produced sliding tubes with required precision (say 5 to 10 micron size difference), 99.9% of people who pull apart the assembly would never be able to put it back together without jamming it. Guaranteed. Even for a skilled workforce this would be not an easy task, which means their factory line schedule would suffer. Not to mention that slightest internal strain in the raw material would mean their success rate would drop like rock in the pond. No more cheap aluminium for that, an expensive aircraft grade annealed alloys would have to be used (mucho $$$$). Try to make tubes with even 10 micron concentricity that work from below freezing to +45 C and you'll see what I mean. The slop is designed in. Deliberately. Well said Bratislav. Especially the part about jamming, and maintaining operation over extreme temperatures. This is not actually an easy problem. Zero tolerance, if you pardon the pun, points us to introduce preloaded linear bearings, or some other kinematic principles, as we have discussed already. That is not required at all. A space of .008" is all that is needed. The tubes I have seen that display mirror shift has had .040". Once they were modified to have no more than .010" the issue was no longer seen. I use CNC milling machines all the time and understand the issues of running the same parts and the tool wear and the changes it presents to the finished parts. Where did you get your "0.008 inch" tolerance from actually ? Not nice is an understatement. BTW, note above plots still represent only about 5 arc minutes of tilt, which is roughly what I see at the eyepiece of my C11 at focus direction change. And it is about the middle of the ground as far as SCT focus shift goes (there are better units out there, but there are worse as well. Some much worse!). Edited by bratislav, 26 August 2014 - 03:55 AM. From working on, machining new mirror sliders and repairing many over the last 25 years. I was able to test for mirror shift and then measure the unit once it was taken apart. Any unit with .008" or less difference in primary and slider, showed no image shift, even at 100x per inch. The units with larger than .008" did. With only .004 per side and the length of the slider, along with the grease was enough to stop the movement. The units that had bad image shift was upward of .050" of play, when measured. I was thinking along these lines as well, that the solution to mirror shift is to use the stock focuser for coarse focusing and a crayford for fine focusing once you get close to what the crayford can handle. With my short profile Crayford focuser I don't ever have to touch the stock focuser once it's set up and adjusted. All my 1.25" and 2" ep's reach focus within the Crayford's drawtube range which is less than an inch. Edited by Gastrol, 26 August 2014 - 11:25 AM. Shoulda kept my Zhumell. Gonna go buy another one. The Questar 7 has linear bearings between the baffle tube and the mirror support. Your TEC might be similar. The Questar 3.5 has sliding tubes, but show little focus shift, probably because someone has the time to minimize the clearances. How difficult would it be to fashion a new carrier tube that incorporated a linear bearing fore and aft of the mirror that would ride on the existing baffle tube? Edited by WesC, 26 August 2014 - 05:05 PM. The problem at hand is not focusing after the SCT has been collimated (via tilting secondary mirror). This is rather trivial to do via aftermarket focuser. What is the issue is that unconstrained primary continues to squeeze the grease and flop around as SCT orientation changes (different elevation, meridian flop, or even simply taking it out of the storage if setup is not permanent as in my case). This flop results in noticeable to severe resolution drop via introduced on axis coma (as shown). Unless SCT is recollimated again, you can kiss goodbye all that fine planetary detail. Linear bearing "sleeve" as above suffers from the same issue as concentric tubes - in order to work properly the inner sleeve (tube) would have to be made to same tolerances as shown before (probably +0, -10 microns), and keep that shape as temperature changes. Ordinary drawn aluminium will simply not do that. You need an aircraft grade annealed alloys. The issue can be alleviated somewhat by using adjustable bearings (so tolerance can go to say +0, -100 micron or whatever) but inner tube has to keep round, which means expensive alloys again. Not to mention that aluminium will eventually groove out on those tiny steel balls (contact area is very small), and your initial tolerances go out of window... You need same or similar hardness on both surfaces for bearings to work for many years, under load. Another issue is differential expansion - aluminium has twice the coefficient of thermal expansion that of steel (which bearings are made from). Your once snug fitting tube will bind in hot summer nights and flop below freezing. There is no way around that - unless inner sleeve is made of steel too. Which I suppose is possible, but would add significant time and $$$ to commercial product. Where this solution has much better chance to work is on secondary, as I plan to do in my 12" f/5.5 CDK (for which I'm just figuring optics now, as we speak). 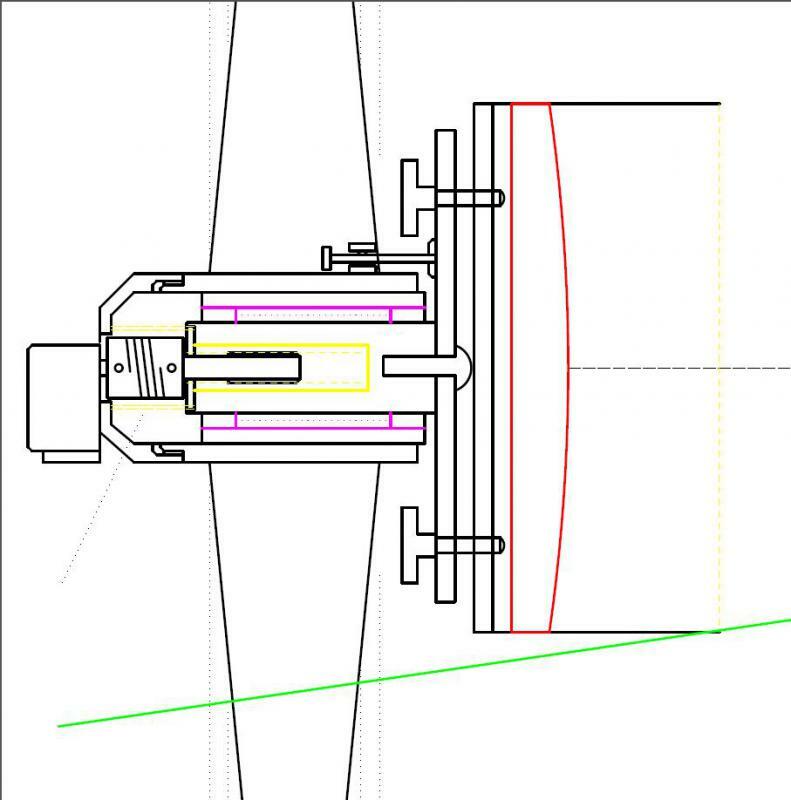 Here, drawn in purple is a linear bearing (adjustable), similar to one shown above. The inner shaft that holds the secondary assembly is stainless steel, with brass insert (in yellow) which runs the focusing leadscrew (driven by a stepper). Edited by bratislav, 26 August 2014 - 06:57 PM. The first solution I posted with the nylon screws has worked on my 8 and 14 SCTs for more than 10 years with no issues. My 14 shows no image shift when focusing even at 700x. Not sure why this did not work for the OP other than the ideas I posted in response. Recirculating ball bearings serve to reduce friction for linear motion. That kind of bearing will not eliminate the slop in the system and may actually make it worse. Shifting the focus position by moving the secondary works well too. I built such a system years ago and it worked just fine (though my early design was not very precise.) The issue for the Celestron is the Hyperstar where you focus by moving the primary. Of course, the Hyperstar itself could be translated for focusing; but, it's not designed to work that way out of the box. So, keep in mind that we are talking specifically about focusing mechanism in Celestrons, which accommodates both the Cassegrain focus and the Hyperstar adapter. The point I keep making is that the problems of focus shift and mirror stability could be very effectively solved with a relatively simple kinematic fix. With the right choice of materials it would be thermally stable and relatively inexpensive to implement. Given the limited space behind the mirror, this is something that would be best implemented by the factory; though I'm sure that an aftermarket solution is possible. Heck, even the nylon screw solution has worked well in PowellAstro's case. I gave up on it only because I didn't want to de-bond the mirror and get into more serious re-machining of the parts. If you want to give me the info on the part you want behind the mirror for roller bearings, I can produce it on the CNC. Hahaha…now you are really tempting me! I just got my new scope so let me think about it a bit. I'll have to pull the old one apart one more time to make more careful measurements of the clearances. In it's simplest incarnation, I'm thinking of simply mounting three small ball bearings to the rear of the mirror cell on screw adjustable brackets. The problem is that the mirror will have to be de-bonded from the cell so that three clearance slots can be milled into the rear of the baffle tube slider where the mirror retainer ring screws on. That way no mirror movement would be lost at the backend to the bearings. I'd also have to drill and thread holes in the rear of the mirror mounting plate to mount the bearing brackets. The three nylon set screws at the front of the slider tube would work fine to zero clearance the forward end. The next level of complexity would be to add a lever arm that pushes along the axis of the slider tube for focusing. That would remove the off-axis moment introduced by the de-centered focus screw that the factory uses. That is going to be a somewhat more difficult retrofit given the space limitations. Bottom line: I'm pretty sure that I can come up with a relatively simple and effective design; but, it's going to be a bunch of work to implement--even if you can make the parts. I'm super busy right now so give me a few days and I'll try to cobble up a drawing that shows exactly what I have in mind. Again, this thing would be very straightforward to engineer and build into new systems and I think that it would be very stable with the potential for zero image shift.